SendinBlue Review: a Genuine MailChimp Alternative? If you want a popular solution, with over eight million users at the time of writing, MailChimp (reviewed here on Elegant Themes) seems the obvious choice. With an attractive and intuitive user interface coupled with an impressive breadth of functionality, it arguably provides you with everything you need in order to launch and manage a successful email marketing campaign. However, there are alternatives available, SendinBlue being a notable example. While it is a younger company with a relatively small user base, it markets itself as a cheaper and superior alternative to MailChimp. But can it really stand up to the might of Freddie & Co.? This article will provide you with a greater understanding of which option is right for you. We’ll start with a brief introduction to both companies, including their respective features and pricing options. We’ll then provide an exhaustive overview of their respective features, WordPress integration capabilities and customer support options, along with anything else you should know about before making the all-important decision. Editorial Note: Since the publication of this article SendinBlue has made numerous updates and additions to their product/service not taken into account for this piece. Please refer to their website for full details on their latest offerings. SendinBlue can trace its origins back to 2011, when its founder Armand Thiberge decided to ‘democratize’ email marketing. He did this by recruiting a team of web developers to formulate a solution for simple, efficient, and fairly priced email campaigns. The result: a platform with over 100,000 users to date. Meanwhile, MailChimp’s foundations go way back to 2001. Born as a side project funded by two web developers, the platform now serves eight million users, with 600 million emails sent per day. It is the go-to email marketing recommendation for a huge number of bloggers. In terms of target customer, both SendinBlue and MailChimp don’t seem to differ much. While they do both provide for experienced users, the core focus of both platforms is on giving email marketing beginners and small businesses the tools to create effective campaigns with relative ease. SendinBlue: a Better Free Option Than MailChimp? SendinBlue and MailChimp both offer free services which are somewhat limited in terms of functionality. But while MailChimp’s service is “free forever“, SendinBlue’s free offering is only available for 60 days. That may make you think that MailChimp has the edge here, but that actually depends on what your needs are. In other words, MailChimp’s free plan doesn’t enable you to send emails automatically – for example, when someone first subscribes, or after they have been subscribed for a certain number of days. For many people the lack of automation renders MailChimp’s free plan almost entirely redundant; only being usable when you want to email subscribers on an ad hoc basis. Meanwhile, SendinBlue does offer automation with their free plan, albeit only for 60 days. (It’s also worth noting that SendinBlue’s free option limits you to sending a maximum of 300 emails per day.) To my mind, that gives you enough time to make a buying decision, which is ultimately what both service providers want you to do. If you are looking for a free longterm email marketing solution then SendinBlue obviously isn’t the right choice. However, if you require automation functionality, you’re going to have to pay eventually, so both services remain viable choices. 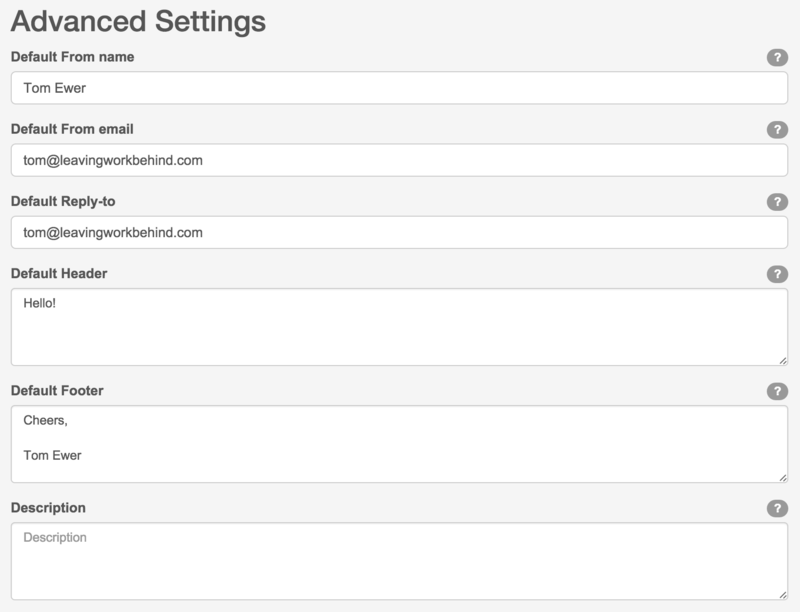 For a full list of the functionality for free versus premium options, click here for SendinBlue and here for MailChimp. SendinBlue: a Cheaper MailChimp Alternative? SendinBlue claims to be “noticeably cheaper” than MailChimp, albeit only “in some cases”, which makes the issue of pricing as clear as mud. On the face of it SendinBlue appears to be the clear winner in terms of pricing, but things are not entirely as they seem. The issue in comparing SendinBlue with MailChimp on pricing is that they follow two different models: SendinBlue charges per email sent, while MailChimp charges per subscriber. For example, if you had a list with 2,001 subscribers and wanted to send just one email per month to your list, MailChimp would be the cheaper option at $30 per month (to SendinBlue’s $39). However, if you had a list with 10,001 subscribers and wanted to send one email per month to your list, SendinBlue would be the far cheaper option at $39 (to MailChimp’s $80). In other words, you’ll have to figure out pricing for yourself, because there is no clear answer as to which service is cheaper. Having said that, if you have a high number of subscribers but send a relatively low number of emails to those subscribers, SendinBlue is the far cheaper option. 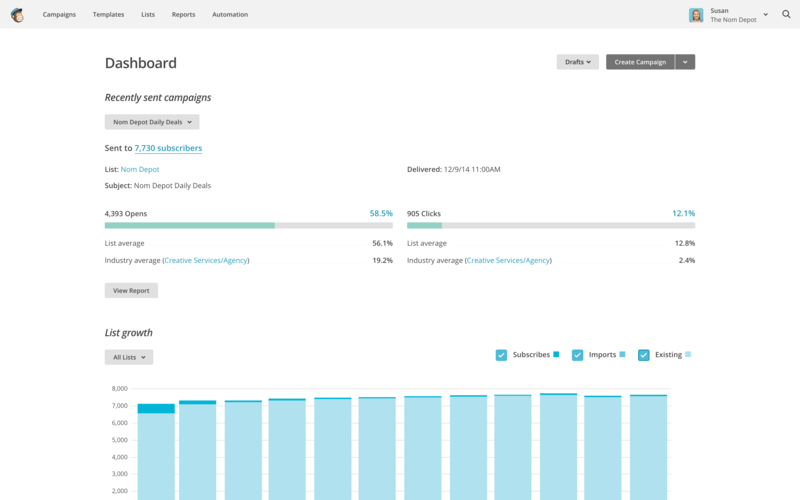 For pricing charts, click here for SendinBlue and here for MailChimp. SendinBlue: Better Functionality Than MailChimp? There’s no denying the fact that MailChimp offers a solid service. The only cracks in an otherwise smooth facade are the lack of telephone support and the potential issues with using affiliate links. So how does SendinBlue compare? In the following few sections, I am going to take SendinBlue’s service for a spin as a first-time user. Buckle up! It’s pertinent to note before we get started proper that SendinBlue isn’t going to win any style or design awards, nor will it be lauded for its compelling copy. It is a French company, and it would appear that the copy is still being written by non-native English writers. It’s more a case of awkwardly worded sentences and typos here and there rather than overbearing incomprehensibility, but it is still somewhat distracting. One would expect that a company seeking international growth would invest in solid copy. You wouldn’t typically expect copy such as “send your emails fast and easy” on the front page of a major service provider. However, for the purposes of this review, let’s not place style over substance in the importance stakes. From now on we’ll put aesthetics aside and focus entirely on usability and functionality. Creating a SendinBlue account is a refreshingly simple process. That’ll lead to a simple form in which you’ll fill in your company name, email address and password. Once you’ve filled in your details and hit the Get Started button, you will indeed be ready to get started – you’ll be taken straight to a welcome screen. We manually verify that all new accounts comply with our terms and conditions (especially to ensure that your database is “Opt-in”). We make this verification after you have programmed and sent your first campaign to more than 10 contacts. You can send test campaigns to less than 10 contacts even if your account has not been validated, but beyond 10 contacts your campaign will not be sent and will be saved as a draft. Once your account is pending approval, an account executive will check your account within a maximum of 48 business hours. It all seems straightforward enough, and gives us the freedom to get started without delay. Creating your first list is remarkably easy, in the sense that SendinBlue has already done it for you. That’s all there is to it with SendinBlue! Creating a list is certainly a more streamlined process than you’ll find at most other email marketing service providers. Once you’ve installed and activated the plugin, then connected your SendinBlue account with your WordPress website with a simple two step process, you’ll be ready to begin. Signup forms can also be added to posts and pages using the [sibwp_form] shortcode. I would describe the end result as functional yet underwhelming. If you’re like me then SendinBlue’s simple signup form markup is welcome – it enables you to make changes to the form’s CSS with ease. However, if you’re looking for a WYSIWYG-style form builder, you won’t find it within the WordPress plugin. While this is no all-singing, all-dancing signup form creator like MailChimp’s, it does give you a good level of control in defining how your form should look if you don’t want to get your hands dirty with CSS. Personally speaking, I am more impressed with SendinBlue’s WordPress plugin than I have ever been with any other email marketing provider’s. In SendinBlue, emails are called ‘Campaigns’. If you want to send an email, create a Campaign. Of the above, step two is the one worth focusing on. As you would expect, the Template step is where you select a template for your email and draft your words. All three options are impressive in their functionality. It seems to me that SendinBlue put a heavy focus on creating emails (a sensible move for an email service provider), and it shows. In the interests of creating content that is readable for everyone, my pick would be the Responsive Design Builder. However, if you want to keep things simple, go with the HTML/Simple Text Editor (that would probably be my choice – I don’t go for bells-and-whistles marketing emails). SendinBlue’s Responsive Design Builder in action. The most important point is this: SendinBlue affords you both power and choice in terms of email creation options. Color me impressed on this front. SendinBlue doesn’t do autoresponders – it does ‘Trigger Marketing’. The phrase seems appropriate, as your emails will be based upon certain ‘triggers’ that are defined within SendinBlue. New trigger marketing campaigns are created via the Campaigns screen, and the creation process is much like that for ‘normal’ emails. However, a great number of variables can be defined in order to determine who receives the email and when. Trigger marketing gives you all of the usual functionality you would expect through its filters and exclusion options. With it you can create an autoresponder series, send emails to people who don’t read emails or don’t click on links, and so on. 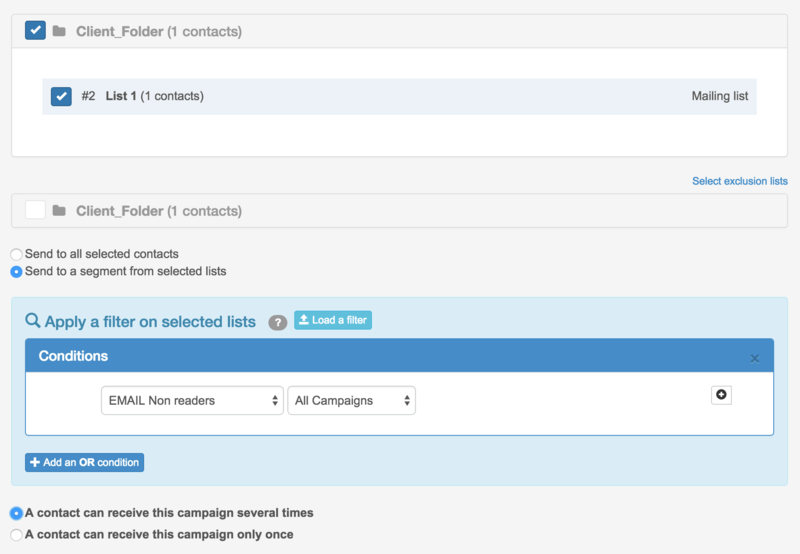 An example of SendinBlue’s trigger marketing functionality. SendinBlue’s trigger marketing feature certainly gives me all the functionality I need on the autoresponder front. SendinBlue’s analytics feature (known as Statistics) was not something I could test in-depth, because I didn’t have a list to send to and analyze. However, its analytics features do impress on paper. It’s clear that the SendinBlue team have worked very hard on producing in-depth statistical data pertaining to just about everything you could possibly hope to know. It’s here, perhaps more than any other area, where SendinBlue’s clear goals for substance over style shine through. Although I didn’t get to make use of SendinBlue’s Statistics feature as much as I would’ve liked to, I was very impressed with what I saw. If you’re a data freak, you’ll be right at home with SendinBlue. If you’re in dire need of any of the above, SendinBlue may not be ready for you yet. MailChimp is somewhat notorious for not offering telephone support – a decision it has stuck by throughout its exponential growth. Despite an excellent knowledge base and quick email support, you can’t really beat the ability to pick up a phone and talk through an issue with another human being. Meanwhile, SendinBlue’s support offering is mixed. As far as I can tell, that is the support link. The link leads to a support ticket form along with a link to their Support Center, which offers a pretty comprehensive list of tutorials for making the most of SendinBlue. Their marketing copy claims telephone support, but I couldn’t find a number. From a practical point of view, it appears that SendinBlue’s support offering is certainly no better than MailChimp’s. SendinBlue strikes me as the plucky upstart; the underdog. It might be a little rough around the edges – perhaps you wouldn’t want to introduce it to your mother – but for the most part, it does the business. Perhaps more importantly for many email marketers out there, it can be seriously cheap when compared to the competition. For example, if you have a list of 10,000 and send say six emails per month, you’ll pay $39 for with SendinBlue, while MailChimp will cost you $75. In other words, unless you’re sending a lot of emails to your subscribers, SendinBlue will almost certainly work out as the cheaper option. And it should do, because the service clearly isn’t as polished as MailChimp’s. While it is making a good fist of providing equivalent functionality on most fronts, the less-than-professional copy, modest aesthetics and occasionally confusing interface highlights its lower budget and relative youth as a service offering. SendinBlue is already delivering (excuse the pun), there’s no doubt about it. A cynic would say that there is lots of room for improvement, while an optimist would point to an already impressive feature set, with plenty of potential for an even greater service down the line. One thing is for sure: when it comes to choosing an email marketing service provider, SendinBlue is a serious contender; not to be ignored. If I were MailChimp, I’d have one eye over my shoulder. I for one am going to think long and hard about making a switch. What are your thoughts on SendinBlue? Share with us in the comments section below! Thanks for information! I usually use MailChimp, but it may be worth to try SendinBlue. If I have two primary lists: list A is non-paying email subscribers and list B is buyers or paying subscribers. With MailChimp, how do I automate removal from one list when subscriber is added to another? I can do that with Aweber, but not with Mailchimp (as I read on other blogs). Can SendinBlue do that also? I’m not totally sure to be honest – I didn’t *see* that functionality when I was reviewing the service, but it may be available. Sorry! The easiest way to do this would be to add a webhook to List B triggered by subscribes. The script called by your callback is fairly simple: Look for the new subscriber’s email in List A and unsubscribe if it exists there. Hi, Will. Can you elaborate further? Adrian’s two lists are both with MailChimp, so “list B” is “inside” of MailChimp. Wobhooks will work on it too? Yes, both lists reside in your MailChimp account, but the script will be hosted in your domain. The webhook from List B (“paid customers”) will be fired everytime someone is added to this list and will hit your script in your domain. That script will then unsubscribe that email address from List A (“Potential Customers”?) using our API. Very interesting article; thanks for the thorough review. The better pricing definitely depends upon the way you use email. If you have a list of 10,001 subscribers that you mail twice a day, the price is wildly cheaper with Mailchimp. I tend to go with pricing that is flat like MailChimp rather than a structure that could really vary depending on changing monthly needs. Sometimes you need to send a correction email or a series for a special campaign, or a daily transactional email as part of a training program in addition to the regular daily email. This would change your price a lot with SendinBlue whereas it would have zero impact on that month’s bottom line at MailChimp. Predictable pricing is more valuable to me so this alone would be enough for me to pass on SendinBlue. Will definitely be checking SendinBlue for its other features. Fair points Zack, and your comments underline how the viability of the pricing is totally open to interpretation and particular use cases. I can safely say for anyone taking email marketing seriously, it would be safer to not use SendinBlue for your email campaigns. The reason why I say this is because SendinBlue doesn’t provide you the option to create a Double Optin email newsletter, there is no option provided to allow the person that will optin to confirm their subscription. And it’s impossible for them to make the verification as they claim if you import your own list of email addresses, because there is no optin history for them to verify. All in all, on first glance SendinBlue looks like a good alternative, but they don’t have the expertise required for what is most important to me as a user … the ability to easily create a correct user double optin flow so I can build a solid and reliable email list. A reply I received from SendinBlue support team when I inquired about double optin because I couldn’t find the option in my SendinBlue account settings….. Thank you for contacting us and for your interest in SendinBlue. Unfortunately, we don´t have the double opt-in feature in SendinBlue, so this is not possible to do. We are available in you have any other question concerning our services. SendinBlue will release the double opt-in feature next week so you will be able to build a reliable email list by using the platform. I’m Alex, Product Manager @SendinBlue.. Double opt-in is indeed essential to build reliable lists and better target qualified contacts. This feature was under development and heavy testing. I’m pleased to inform you that it will in be in production in less than a week! Thank you for the comment! I don’t know when you have discussed with SIB support, but actually the double opt-in feature will be released next week :). Also something really important for Tom and other people who commented here is that SendinBlue is much more than that, they offer an Marketing Automation tool, basically what they are doing is : they are making a powerful and expensive feature available to small businesses , here is how it looks like : http://www.awesomescreenshot.com/image/207758/0a229b13793ee223ef02c6643ff01bf3 . Thank you for your article. 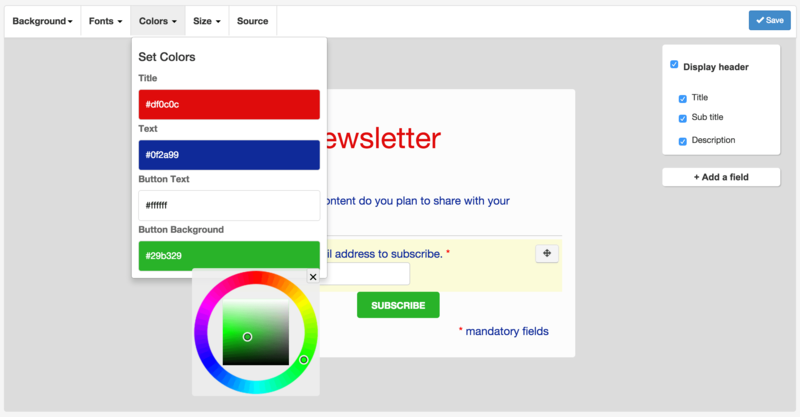 Also I wish to share my experience here about sending newsletter emails from WordPress CMS. The best solution for me is MyMail Newsletter Plugin (http://mymail.newsletter-plugin.com/) in combination with Mandrill email sender (https://mandrill.com/), almost one year of good experience. Before I used to send emails champagnes with Interspire Email Marketer (http://www.interspire.com/emailmarketer/) in combination with SMTP.COM sender, but that was out of WordPress and a bit expensive solution. From client side I have received request to have all necessary services inside of WordPress and with this combination of MyMail and Mandril I was satisfied the client. It is really worth to try. Thanks for your suggestions Obrad! I second Mandrill. Even though they are owned by Mailchimp, they have been very good to my sites that don’t have a lot of users. Mailchimp is great for the “regular” business but I wouldn’t advise for anything Internet Marketing. They don’t like affiliate marketing. If it send up to 40,000 emails per month, than you are obviously the winner. But what about Delivery rate? 100% delivery? or sometimes fails? Where does MadMimi fit in? I’ve been hearing about it lately. One other thing about MailChimp is if you have for example 1000 of the same subscribers on 3 lists they count that as 3000 subscribers – not 1000. Very true Susan – thanks for pointing that out. As for MadMimi, I can’t say I know a great deal about it I’m afraid. Nice timing on the article, Tom. I was just about to compare Mail Chimp to Send in Blue. This is the second positive article I have read about them. I think a better option than Sendinblue would be MailerLite. I’d like to see a comparison of it and Mailchimp. How about a review of RapidResponsebot in the near future? It’s designed for internet marketers by an internet marketer. With a special offer right now for a lifetime membership, it sounds worth it. Even the regular membership is more than competitively priced. I started using it last year; easy to use, automation included, delivery rates are high. I’d like your opinion before I switch completely. The sales page is at rapidresponsebot.com, with a .net address for user access. One of the comments on Mailchimp is incorrect. I have a free plan, and Automation is definitely included. it used to be included. I have an old account where it is free and a new one where it is not. I have been using MailChimp for some months now and i was thinking to replace it with another similar Mail Marketing Platform and after i read this post i know exactly what email marketing platform should i choose after i cancel my MailChimp Subscription. Great read. MailInBlue looks impressive. I have to say, I don’t see much that looks “unpolished” there. It’s great to see someone taking a shot at MailChimp’s absurd prices. Email prices have plunged in recent years thanks to cloud computing services like Amazon Simple Email and others. MailChimp seems to have not noticed, and kept their same (now silly) prices. It’s not just MailInBlue that’s making MailChimp look stupid, it’s a half dozen other competitors too. Watch for email-marketing rates to fall dramatically in the next year or so. MailChimp is using an outdated playbook, and yes, they should keep one eye over their shoulder. They need to drop prices significantly, or they’re going to suddenly find themselves priced out of the market they pioneered. I read that in pricing section SendinBlue offers 40,000 emails / month on unlimited quota per month at the price of $7.37 /mth. – Send 5,000 emails one time per month for $7.37 and to Send 20,000 emails 3 times per month for $39. So in Micro plan we cant send 40,000 emails to 40,000 users or there is some limitation? With SendinBlue’s Micro plan ($7.37 per month) you can send up to 40,000 emails per month. You don’t have a daily quota with the Micro plan so you cand send the 40,000 emails all at one time or spread out during the month. This is intriguing. I’m trying to find a replacement for ExactTarget (now Salesforce). My list is over 20k and I’m trying to sort out the best option. Tom, just curious … do you get compensation from SendInBlue? as soon as you sign in for a plan, next they ask you to pay for dedicated IP, even if you only got a small amount of subscribers(2k) and send 4k e-mails a month. Can you go into more detail on the autoresponder with Sendinblue? It’s very complicated to get it working because of this “trigger marketing” thing where you need to use the search filters to even get it working. We would be happy to help walk you through the setup of your first trigger campaign! If you have already checked out these tutorials and are having an issue, please submit a ticket through your account or if you’re in the US, give us a call at 1-844-338-5050 between 8 am – 5 pm (PST). We’re here to help! Very helpful article. Thank you very much! One thing to add. Are these the final prices for SendinBlue? Because if you note on their pricing page https://www.sendinblue.com/pricing/ it states Pre-tax price. Is this going to affect the final price? My guess is that yes. We only add on taxes for users in the countries where we are required to do so. Tried to send out campaign using the free version and upload csv of my lists but turned down. They can’t validate if the email addresses are opt-in and won’t give any option if you are using the free plan. I guess it’s not that good enough for Mailchimp alternative. We’re very sorry that you were not happy with your experience with our service. We make every effort to be transparent with our users that 100% of contacts messages with our service must be opt-in and have agreed to receive messages. This policy is in place to comply with global laws, and to protect SendinBlue users and email recipients alike. Since your first campaign produced results consistent with non-opt-in contacts and you did email us confirming that your contacts were not opt-in, we could not allow you to continue using SendinBlue. If you have any additional questions or concerns, we’re happy to talk with you. Please send us an email to [email protected]. No, the CSV works fine. It’s sort of a two step process but quite easy. You must be making a mistake. I use it every single month and have done so for a couple of years. I recommend giving it another go. Trust me, MailChimp has nothing special over Send In Blue when it comes to uploading and downloading CSV files! My concern is backing up or exporting your list of subscribers. In my conversation with Sendinblue that option does not exist? I seriously would be suspicious if they owned my subscriber list. I hope I’m wrong as affordability is key. Pricing by the size of a list can get outrageous! I wonder what Groupon uses! If you run into any issues, please let us know and we’ll be happy to help you create the export. Email us at [email protected] or submit a ticket from your My Account dashboard for the quickest reply. Yes, it’s quite easy to import and export. I do it every month! I’ve used Send In Blue to send out monthly updates to my subscribers at THE small HOUSE CATALOG for a couple of years. The interface is so easy to use, the templates are responsive so there’s no concerns about configuring for specific formats, and the website and emails are reliable. All of my previous mailings are also archived for replicating subsequent mailings, quite handy. Having used MailChimp and tried a couple of other sources for email marketing I find I’m way happier at Send In Blue with zero thought of even trying another service. How’s that for a pitch? Better yet, for most people at least, Send In Blue has integrated with WordPress. I can only think of one thing I’d like to see for ME and that’s a full integration with Squarespace too. When it comes to reliability MailChimp is fine (it was at the time I used them). But for small-mid sized needs I wouldn’t even give them a thought as they’re so expensive. Send In Blue not only works as well if not better but it’s also perfectly priced. Why pay more? Why?! Check out Send In Blue!!!! Sendinblue is the classic example of modern day internet fraud. We have singup to sendinblue and Micro Plan and paid for the same. We paid on 02/02/2016 and sent a campaign to 14,000 optin subscribers. (Earlier we where using sendgrid) after few hours we got a email that the account is suspended without any reason and refund will not be processed. We tried contacting sendinblue via email but we have not got any satisfactory response. After few days they send a response that the open rate is not satisfactory as per them. But when we asked that, whey they have not told this thing earlier they again don’t have answer. Don’t go ahead with them, they are irresponsible, cheaters & fraud. Thank you for taking time to talk with us and share your experience. We’re very sorry for the frustration you’ve experienced with the closing of your account. As shared by our team, the reason for the closure was due to poor performance from your campaign – these results are typically associated with sends to non opt-in contacts. However, we do understand your disappointment, which is why our team did issue the requested refund. We appreciate your feedback and will certainly use it to improve.